When Typhoon Nisha lashed northern Sri Lanka in the last week of November 2008 it caused extensive damage to the roofs of thousands of newly constructed homes, forcing the World Bank to reassess the type of roofing used in its multi-million dollar housing projects. Jaffna, 400km north of Colombo, was hit hardest, according to the National Disaster Management Centre, with nine killed and over 290,000 affected by flooding. Some 34,000 houses were damaged. The Bank has been involved in a US$150 million project - begun in March 2005 - to rebuild 34,780 conflict-damaged homes in northern and eastern parts of Sri Lanka, and has been using asbestos sheeting rather than the more traditional clay tiles for the roofs. The Bank said 24,000 houses out of 34,780 had been completed by December 2008, and 4,300 were nearing completion. 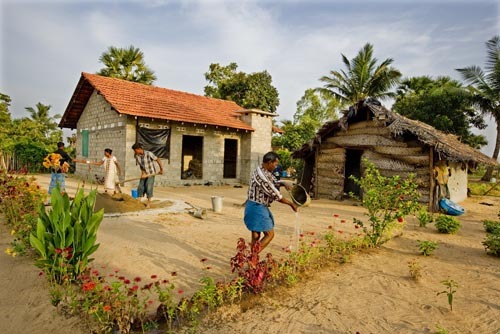 (The reconstruction of 5,778 houses in the conflict affected Kilinochchi and Mulaithivu districts had been put on hold since mid-2006 due to security risks). "We approximate that 1,500 rebuilt houses [out of 4,600] in Jaffna had been affected by cyclonic winds [from Nisha] that damaged the roofing sheets," Naresha Duraiswamy, senior operations officer South Asia - Urban, Water and Sanitation at the World Bank in Washington D.C., told IRIN. "It is estimated that perhaps 20 percent of the total caseload of houses in Jaffna were subjected to some damage." Duraiswamy said that when the project began the recipients had preferred tiles over other sheeting that contained asbestos, but was safe, having passed environmental and health and safety standards in the developed world. The Bank had decided to use the sheeting because the material was cheaper and more efficiently transported by sea from Colombo to Jaffna. "The traditional preference is for clay tiles, but given their weight, they were more expensive to ship to Jaffna and more prone to damage en route," Duraiswamy said. Clay tiles are cooler in summer and the traditional architecture on the peninsula, but producing large quantities of them in Jaffna was impossible given the ongoing security crisis, he said. Duraiswamy said the roofs were constructed to withstand 40km per hour winds, in compliance with the national construction standard in Sri Lanka, but Nisha generated winds of twice that speed, not only damaging the sheets but the rafters as well. He added that the 40km per hour specification was clearly insufficient in the context of the tropical storm with its 80km per hour winds. "The winds damaged individual clay tiles, but such tiles could be easily replaced as the rafters - made out of coconut or Palmyra timber - remained intact in most cases," he told IRIN. "The (asbestos) roofing sheets, however, were fixed to the rafters and lintels. The winds not only blew away the roofing sheets but also damaged the lintels. The International Development Association (IDA), the Bank's agency that lends to poorer nations, now recommends that the reliance on roofing sheets be reassessed."